Wednesday - Today was a beautiful day for riding. We had only a mild cross wind, and it was sunny but cool all day. It was a challenging ride, though, with large rolling hills the whole way. 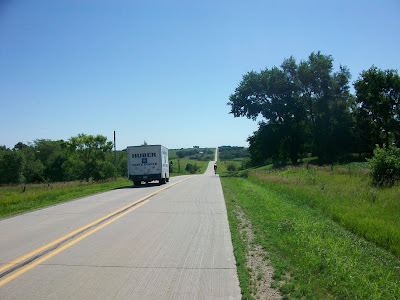 I thought Iowa was supposed to be flat, but Southern Ontario is definitely flatter than what we've been riding through. Still, with the beautiful weather and landscapes, most of the riders enjoyed themselves today. Along the way I met up with Marc and Rachel in a donut shop. A local approached us while we were having a donut and coffee to ask what we were doing. After we explained that we were riding across the continent to raise money to fight poverty, she gave us four dollars. We definitely attract attention whenever we stop along our ride and are often asked what we're doing. After dinner, the members of the United Church here in Diagonal offered us pie and ice cream as a fund raiser for their church. I had a piece of pecan pie along with two scoops of home-made ice cream covered in chocolate sauce and nuts. It was delicious! We started riding June 24th and will finish riding August 24th, so today, July 24th, is the middle day of our tour. Since we didn't ride for a few days in Arizona, we won't be reaching the halfway point in terms of distance until Friday, I believe. You should set a goal to eat coffee and donuts in every state at some point in your life - sounds like you've already got CA, AZ, NM, CO, KS, NB, and IA covered! We passed the distance halfway point today (Friday). I can't think of any other interesting halfway markers.